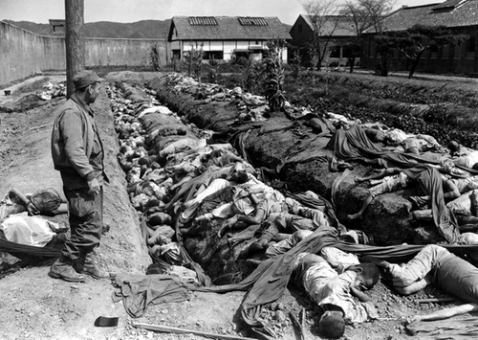 Bodies from a massacre carried out by the US Army's 7th Calvary Division at No Gun Ri, Korea from July 25-29, 1950. Despite widespread agreement among legal scholars the massacre constituted a war crime, no one was ever prosecuted. International humanitarian law, also called the rules of war, embodies the most basic expectations we hold for one another as co-inhabitants of the same world. Most notably embodied in the Hague Conventions of 1907 and the Geneva Conventions of 1949, international humanitarian law seeks to limit the barbarity of inherently barbarous occurrences. Yet, despite being the most powerful military power in the world since the end of World War II, and therefore possessing the greatest obligation to ensure the integrity of the rules of war, the United States has rarely worried about the responsibilities it carries as a result of this set of laws. The United States has routinely neglected its duty to prosecute war criminals and has obstructed countries and international organizations who have attempted to do so. No senior US official has ever been prosecuted for a breach of international humanitarian law, despite many senior officials having committed breaches. The War Crimes Project is an effort to change this state of affairs by attaining accountability for the worst war crimes committed by the most powerful living Americans. To this end, the War Crimes Project encourages a decentralized combination of activism and education to win the prosecutions of notable offenders. Through a combination of raising awareness, lobbying government officials, and participating in direct action, we believe we will see a day when American war criminals are prosecuted through the judicial system they once helped administer, a modicum of justice can be restored to the victims of war crimes, and some meaningful status can be accorded to international humanitarian law. The War Crimes Project has no agenda beyond the publicly stated goals laid out on this website. It has no requirement for membership beyond agreement with the information contained on this website. There is no hierarchical chain of command. Any nonviolent action that furthers the goals of this project can be rightfully termed part of the War Crimes Project, so long as its participants choose to do so. A woman lays dying after being shot and having her breasts cut off by the US Marine's 2nd Brigade during the massacre at Phong Nhi, Vietnam on February 12, 1968. No investigation ever occurred and nobody was ever prosecuted. The purpose of this website is to serve as a clearing house for people wishing to join the War Crimes Project. Here, you can find information, resources, and advice as to how you can join this struggle for justice. You can also contact us if you have any comments, questions, concerns, or suggestions regarding the project. We hope you take advantage of the resources here and we hope to see you with us in the streets.